The Line of Fate can be a difficult line to spot, and indeed not everyone even has a Fate Line. Some people’s lives do seem to be ‘fated’, for good or ill, but these days we tend to believe ‘you make your own luck’ and that a positive approach can change your destiny. Your Line of Fate can say something about how you visualise your life. Studying it can give you more choice and control. See also 'YOUR INTRODUCTION TO PALMISTRY', 'THE LINE OF HEART', 'THE LINE OF HEAD', 'THE LINE OF LIFE' & 'WHAT YOUR THUMB SHOWS'. This line runs up the centre of the palm, towards the base of the biggest finger, the second finger. This is called the Finger of Saturn, and the mount on the palm at its base is called the Mount of Saturn. In astrology Saturn relates to hard work, restriction, challenges and ambitions, and it is similar on your palm. Your Fate Line shows what motivates you and what influences you. •	A clear, deep straight Fate Line is not necessarily the best sign. If the line is thick, straight and with no branches, it can mean that you feel imprisoned by destiny and rather isolated. The best Line of Fate, although distinct, isn’t very heavy or wide. •	For good fortune the Line of Fate should be accompanied by a Line of Sun (see THE LINE OF SUN) which runs almost parallel, towards the ring finger. •	A Line of Fate starting at the wrist and running straight up the palm, onto the Mount of Saturn indicates success and luck, providing the Line of Sun is also present. •	Rising from the Line of Life indicates that the family have a great deal of influence at the start of life, and there may be restrictions and hardship. However, if the Fate Line is well-marked, this shows you can make your way by your own efforts, and come good. •	Rising inside the Line of Life, on the Mount of Venus (i.e. on the fleshy pad below your thumb) shows you can be swayed by loves and passions and need to be careful who you fall for, because they can decide your fate. •	Rising from the Mount of the Moon (i.e. 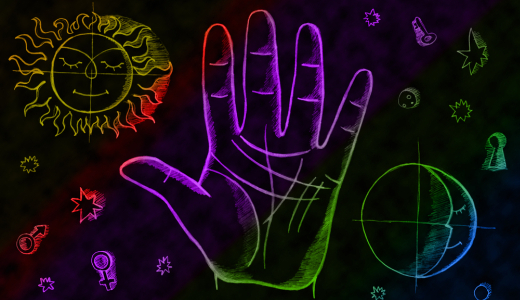 the large, fleshy pad on the outside of your palm, opposite your thumb) can mean a changeable destiny, often influenced by other people and by your own imagination, either positive or negative. •	Starting in the middle of your palm, your Line of Fate indicates a slow and often difficult start, but you can be successful. •	If your fate Line starts on your Head Line you make your way by your wits and brains. •	Islands on the Fate Line show possible bad times. If you have lots of islands, so the line looks like a chain, make sure you concentrate, keep your eye on the ball and have a sense of self-preservation. •	No line at all means an ordinary, uneventful life. •	Small lines running into the Fate Line indicate influential people, especially partners. •	A double Line of Fate can mean a double life – maybe two careers. If the lines eventually unite this may indicate a long-lasting love that eventually results in commitment. A truly ‘double’ line where both are distinctly marked, could mean that you have two lives that you keep separate from each other. •	ALWAYS REMEMBER that lines on the palm change, and you can change your fate. If you are determined, if you visualise creatively and work hard, that dodgy Fate Line can morph, over a few years, into something much more encouraging, so keep at it! Of course there are times when you need some knowledge and positive input that you can’t get from analysing your hand. You may also want someone wise to talk to about your interpretation. Don’t worry – at TheCircle we have all that you could wish for in psychic readings and clairvoyant readings. Why not call us today, to be connected to a medium, or psychic and to feel supported and guided.